1. A is B’s brother. C is D’s father. E is B’s mother. A and D are brothers. How is E related to C? 2. B is the brother of A, whose only sister C is mother of D. E is maternal grandmother of D. How is B related to E? 3. Raju is the brother of Alok. Sunita is the sister of Sunil. Alok is the son of Sunita. How is Raju related to Sunil? 4. A and B are sisters, R and S are brothers. A’s daughter is R’s sister. What is B’s relation to S? 5. E is the sister of B, A is the father of C, B is the son of C. How is A related to E? 6. 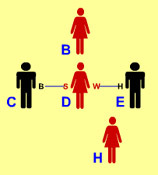 A is B’s brother, C is A’s mother, D is C’s father, E is B’s son. How is D related to E? 7. B is D’s mother and C is D’s brother. H is E's daughter whose wife is D. How are E and C related? 8. Given that A is the mother of B. C is the son of A. D is the brother of E. E is the daughter of B. Who is the grandmother of D? 9. A is D’s brother. D is B’s father. B and C are sisters. How is A related to C? 10. Savita is the niece of Ashok, whose is mother is Lavanya. Lavanya's mother is Kavita. Kavita's husband is Govardhan. Padma is the mother-in-law of Govardhan. How is Savita related to Govardhan? 11. A is B’s sister. C is B’s mother, D is C’s father, E is D’s mother, then how A is related to D? 12. If B is the brother of A, D is the daughter of A, L is the sister of B, M is the brother of D, Who is the uncle of M? 13. Reena is the daughter-in-law of Vinay and sister-in-law of Suresh. Manoj is the son of Vinay and only brother of Suresh. Find the relation between Reena and Manoj. 14. Suresh introduces a man as “He is the son of the woman who is the mother of the husband of my mother”. How is Suresh related to the man? 15. B is A's brother. C is A's father. D is C's sister and E is D's mother. How is B related to E?